I scream, you scream, we all scream for public cloud service. It’s so popular, in fact, that VMware is offering the service direct, targeting enterprises who are already large VMware shops. Is AIS worried? Nah. By definition our services are tailored to our clients’ needs and include large dollops of customer service and extremely high-end (e.g., high-performance) compute, storage, and networking. This is what sets us apart and why there will always be a large market for what we offer. If vanilla IaaS were sufficient, there would be only one provider (AWS) and the market would be much smaller than it is — and will be. Article by Jon Brodkin in Ars Technica. VMware today unveiled its first public infrastructure-as-a-service (IaaS) cloud product, putting the virtualization software vendor into direct competition with Amazon Web Services. When combined with its in-house software, VMware’s cloud also provides an alternative to the virtualization/cloud synergy Microsoft is trying to achieve with Hyper-V, Windows Server, and Windows Azure. Like Amazon and other IaaS providers, VMware’s public cloud will offer access to virtual computing resources hosted in data centers in four US regions (with non-US data centers coming next year). VMware’s biggest opportunity probably isn’t in stealing customers away from Amazon or Microsoft, however. Rather, the VMware cloud will likely appeal the most to businesses with big VMware deployments—this is a strategy to wring more money out of customers already paying a premium for virtualization software. VMware’s cloud could be used by customers without any VMware software in-house, but it will be more useful to businesses that can use the cloud as a logical extension of their own VMware-driven data centers. 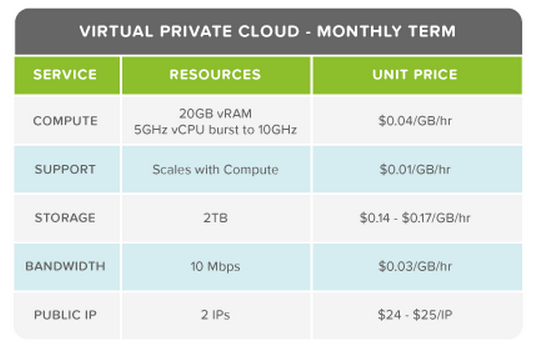 The VMware cloud’s name, “vCloud Hybrid Service,” reflects the customer base it will most likely attract. VMware’s US-based services will be available to early access customers in June and will be generally available in the third quarter of this year from data centers in Santa Clara, CA; Dallas, TX; Las Vegas, NV; and Sterling, VA. Services will be offered from data centers in Asia and the EMEA (Europe, Middle East, and Africa) sometime in 2014. Customers outside the US aren’t prohibited from using the US-based services, but they would have to handle some latency. That’s discounted pricing for subscriptions. Customers will have to pay more for shorter-term deals or one-time uses. The pricing does not include the cost of operating system licenses and looks to be less flexible than Amazon’s, but that’s likely not a problem when it comes to attracting users already locked in to VMware’s vSphere virtualization and data center management platform. By using vSphere in combination with vCloud Hybrid Service, customers will be able to spin up new applications in the cloud using vSphere, or they can add capacity to applications without buying more hardware for their own data centers. Applications can draw from resources both in a customer’s data center and in a VMware data center and appear to be on the same network. On its own, VMware’s vCloud Hybrid Service is more analogous to Amazon’s cloud than Microsoft’s because it offers pure infrastructure rather than a platform optimized for developers to build and host new applications. Windows Azure began as a platform-as-a-service (PaaS) cloud only, just recently expanding to include infrastructure-as-a-service. “You don’t actually have to buy vSphere unless you were going to deploy an on-premises environment. You could just buy the off-premises vCloud Hybrid Service,” VMware Director of Partner Strategy Mercer Rowe told Ars. However, the real value is derived by combining on-premises and cloud-based deployments and managing them from the same interface, he said. That’s similar to how Microsoft’s on-premises software can be used in conjunction with Azure. VMware said there are 3,700 applications certified to run on vSphere and vCloud Hybrid Service. vCloud Hybrid Service can run any of the “more than 90 operating systems” already certified to run on vSphere. Rather than sell virtual machines preloaded with operating system images, VMware “sells pools of compute resources (RAM and CPU) to the customer and allows them to create VMs based on their needs,” a company spokesperson told Ars. Customers can use their own OS images or use templates from VMware’s catalog, which includes Windows and Linux configurations. “VMware will be reselling OS and application licensing for VMs generated out of the global VMware catalog where needed,” the company said. In other words, the prices can’t be easily compared to Amazon’s, which sells VMs preloaded with operating systems and includes the licensing cost in the advertised price. VMware said it is also teaming with SAP to offer hosted versions of the company’s enterprise applications, including the HANA database. While this is the first IaaS cloud offered by VMware directly to customers, it’s not the first cloud service based on VMware software. VMware has been selling cloud infrastructure software to service providers for several years, meaning the vCloud Hybrid Service is potentially a competitor to VMware’s own partners such as AT&T and Verizon’s Terremark. VMware is trying to soften the blow by working with partners to help them offer add-on services for vCloud Hybrid Service, such as consulting and management. VMware will also make the underlying vCloud Hybrid Service technology available to providers so they can build new cloud services of their own, perhaps targeted to specific industries or geographic regions. VMware partners also offer network and colocation services that might differ from VMware-branded-services, Rowe said. 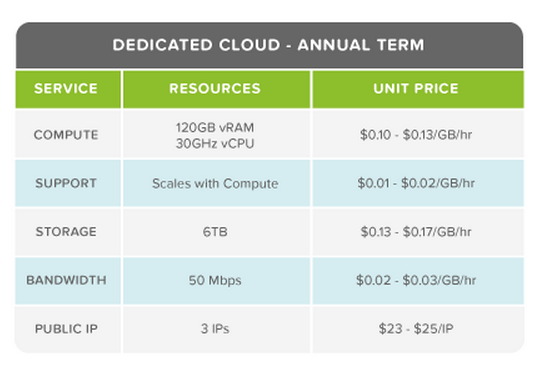 VMware has plenty of cloudy competition in addition to Amazon and Microsoft. Besides longstanding IaaS vendors like Rackspace and GoGrid, Google offers App Engine and Compute Engine to cover both the PaaS and IaaS markets.